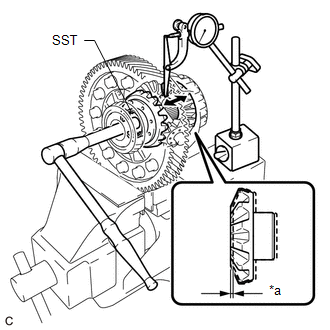 (a) Using SST, rotate the front differential side gear as shown in the illustration. 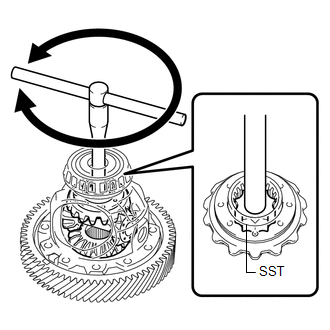 The front differential side gear does not lock when rotated in either direction. If the front differential side gear locks, perform all inspections. If the front differential side gear still locks even after replacing the malfunctioning parts, replace the front differential case. (b) Using SST and a dial indicator, measure the front differential side gear thrust amount. Measure the front differential side gear thrust amount while slowly rotating the front differential side gear. Make sure to measure the front differential side gear thrust amount for both of the front differential side gears. If the result is not as specified, replace the 2 front differential side gears, 2 front differential pinions and 2 conical springs. (b) Secure the front differential case in a vise between aluminum plates. (c) Install the front No. 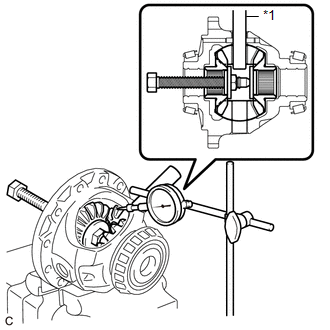 1 differential pinion shaft to the front differential pinion as shown in the illustration. (d) Using a dial indicator, measure the front differential pinion backlash. Select front No. 1 differential side gear thrust washers of the same thickness for both the right and left side. If the backlash is not as specified, replace the front No. 1 differential side gear thrust washers with washers of a different thickness. Use the table below to select front No. 1 differential side gear thrust washers which will ensure that the backlash is within the specification. 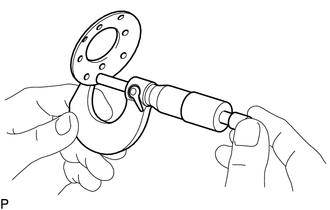 (a) Using a micrometer, measure the thickness of the front differential pinion thrust washer. Measure the most worn portion of the front differential pinion thrust washer. If the thickness is less than the minimum, replace the front differential pinion thrust washer. 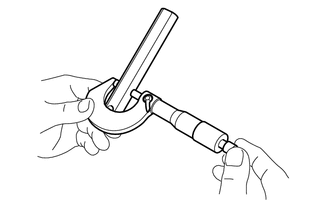 (a) Using a micrometer, measure the outer diameter of the front No. 1 differential pinion shaft. Measure the most worn portion of the front No. 1 differential pinion shaft. If the outer diameter is less than the minimum, replace the front No. 1 differential pinion shaft.